Keith Casey had a brief professional career, but he has stayed in the game. He's stayed in as a youth coach, and he's worked as an independent scout, looking for talent to send off to college. 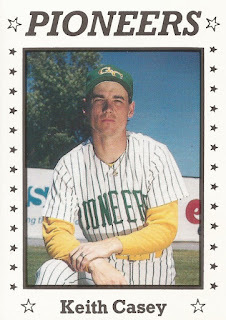 Casey's brief pro career began and ended in 1990, signed by independent Gate City as a free agent out of college. Casey attended San Diego City College. He went to San Diego out of Alhambra High School in Martinez, Ca. With Gate City, Casey got into seven games, all in relief. In 10.1 total innings, Casey gave up 18 earned runs. He struck out four and walked nine. It was the extent of his pro career. Casey has since settled in the Sacramento area, learning scouting from Sports Management WorldWide. Casey also works as a youth instructor, and coach, heading up the Fair Oaks Crawdads travel baseball team.